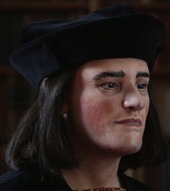 Press Conference at the University of Leicester – it is Richard III! A press conference at the University of Leicester was specially convened on 4 February 2013. At 10h40 (local time) it was announced that the human remains found during the archaeological dig in the area of Leicester’s Greyfriars were those of King Richard III. The identification was based on a wealth of scientific evidence, including radiocarbon dating, radiological evidence, DNA and bone analysis and archaeological results. This entry was posted on Monday, February 4th, 2019 at 8:00	and is filed under Events in History. You can follow any responses to this entry through the RSS 2.0 feed. You can leave a response, or trackback from your own site.